Rubber Room Ramblings: SIMPLE SCENIC SEASON! This card looks familiar; right? Well, you saw a "slightly-altered version" of it posted yesterday. I needed on last card for my Holiday Stamp-A-Stack class this month, so this is the one I decided on. I always try to keep those cards very simple because my customers make 2 of each of 5 different designs. Yep, that's a total of 10 cards in just 2 hours. This card fit perfectly into what I wanted! 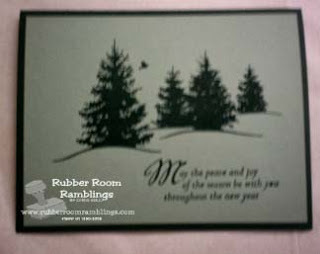 For this card I used the sentiment from the Scenic Season Stamp Set, as well as the tree image. For stamping specifics, just read my posted from yesterday.